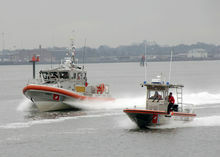 The Response Boat – Medium (RB-M) is a 45-foot (13.7m) utility boat used by the United States Coast Guard. It is intended as a replacement for the Coast Guard’s fleet of 41′ utility boats (UTB), which have been in use by the Coast Guard since the 1970s. The Coast Guard plans to acquire 180 of these RB-Ms over a 6–10 year period. The boats will be built by Kvichak Marine Industries of Kent, Washington and Marinette Marine Corporation of Marinette, Wisconsin. According to the U.S. Coast Guard, “While primarily a Search and Rescue (SAR) asset when the 41′ UTB was first fielded, the evolution of missions has increased the requirement to perform many missions including Recreational Boating Safety (RBS), Marine Environmental Protection (MEP), Enforcement of Laws and Treaties (ELT), Ports, Waterways, and Coastal Security (PWCS) and Defense Operations (DO), including those traditional missions associated with Homeland Security.” In August 2010 the US government donated three boats for drug interdiction to Albania, where they are known as the Archangel class. In keeping with standard USCG practice, boats of this size have hull numbers and are not named. This type of boat has a hull number beginning with the length of the boat (45′) and then a sequential number. In the case of the RB-M boats, the hull numbers begin with 601. Thus the first boat will be RB-M 45601. The Albanian boats are called Archangel 01, 02 and 03.